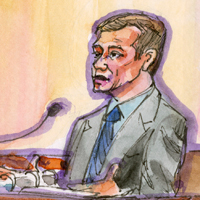 On the fourth day of trial, social epidemiologist Ilan Meyer testified about the harm gays and lesbians have experienced because of Proposition 8. At the time of trial, Meyer was a Professor of Clinical Sociomedical Sciences and Deputy Chair for MPH Programs at the Department of Sociomedical Sciences at Columbia University’s Mailman School of Public Health. He is now Senior Scholar for Public Policy at the Williams Institute for Sexual Orientation Law and Public Policy at UCLA’s School of Law. Dr. Meyer is co-editor The Health of Sexual Minorities: Public Health Perspectives on Lesbian, Gay, Bisexual and Transgender Populations, an influential text that offers a multidimensional picture of LGBT health, incorporating contributions from across clinical and social science disciplines. Watch Jesse Tyler Ferguson reenact Professor Meyer’s testimony during the Los Angeles premiere of “8” the play. “The first [part of my testimony] is on the nature of stigma. And I will testify to the effect of stigma on gay and lesbian populations with reference to Proposition 8 as an example of a stigma. “The second part will describe a model of minority stress that is a model that I am credited with authoring, and has been referred to in much of the literature on gay and lesbian health. And I will describe how social stressors affect gay and lesbian populations. “There are really many stigmas and stereotypes that describe kind of how people are perceived. “In my work, I have written about the role of intimate relationships and the way intimate relationships have been portrayed. “Proposition 8, in its social meaning, sends a message that gay relationships are not to be respected; that they are of secondary value, if of any value at all; that they are certainly not equal to those of heterosexuals. “And, to me, that’s—in addition to achieving the literal aims of not allowing gay people to marry, it also sends a strong message about the values of the state; in this case, the Constitution itself. And it sends a message that would, in my mind, encourage or at least is consistent with holding prejudicial attitudes.